Just as many people are surprised to find themselves packing on unexplained weight around the middle, astronomers find the evolution of bulges in the centres of spiral galaxies puzzling. A recent NASA/ESA Hubble Space Telescope image of NGC 4710 is part of a survey that astronomers have conducted to learn more about the formation of bulges, which are a substantial component of most spiral galaxies. When targeting spiral galaxy bulges, astronomers often seek edge-on galaxies, as their bulges are more easily distinguishable from the disc. This exceptionally detailed edge-on view of NGC 4710 taken by the Advanced Camera for Surveys (ACS) aboard Hubble reveals the galaxy's bulge in the brightly coloured centre. The luminous, elongated white plane that runs through the bulge is the galaxy disc. The disc and bulge are surrounded by eerie-looking dust lanes. When staring directly at the centre of the galaxy, one can detect a faint, ethereal "X"-shaped structure. Such a feature, which astronomers call a "boxy" or "peanut-shaped" bulge, is due to the vertical motions of the stars in the galaxy's bar and is only evident when the galaxy is seen edge-on. This curiously shaped puff is often observed in spiral galaxies with small bulges and open arms, but is less common in spirals with arms tightly wrapped around a more prominent bulge, such as NGC 4710. NGC 4710 is a member of the giant Virgo Cluster of galaxies and lies in the northern constellation of Coma Berenices (the Hair of Queen Berenice). 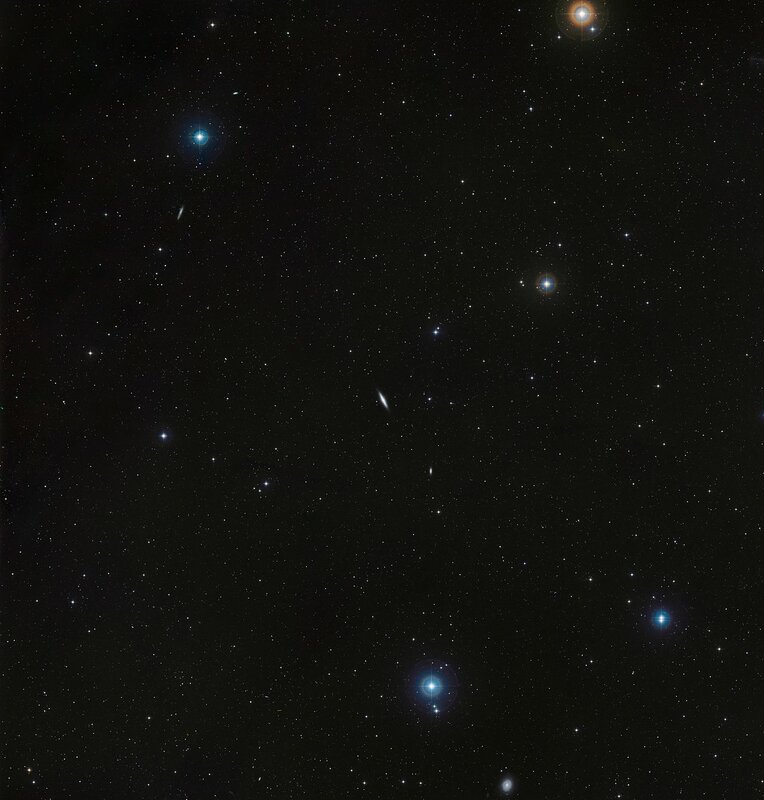 It is not one of the brightest members of the cluster, but can easily be seen as a dim elongated smudge on a dark night with a medium-sized amateur telescope. In the 1780s, William Herschel discovered the galaxy and noted it simply as a "faint nebula". 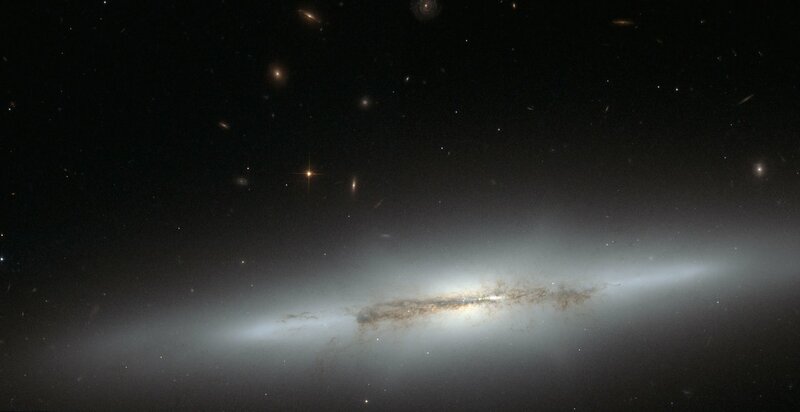 It lies about 60 million light-years from the Earth and is an example of a lenticular or S0-type galaxy – a type that seems to have some characteristics of both spiral and elliptical galaxies. Astronomers are scrutinising these systems to determine how many globular clusters they host. Globular clusters are thought to represent an indication of the processes that can build bulges. Two quite different processes are believed to be at play regarding the formation of bulges in spiral galaxies: either they formed rather rapidly in the early Universe, before the spiral disc and arms formed; or they built up from material accumulating from the disc during a slow and long evolution. 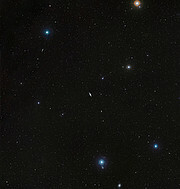 In this case of NGC 4710, researchers have spotted very few globular clusters associated with the bulge, indicating that its assembly mainly involved relatively slow processes. These observations were obtained by a team led by Paul Goudfrooij from the Space Telescope Science Institute in Baltimore, Maryland, USA.